When we.speak-cf the family, we ordinarily think of a husband and wife, their children, and occasionally an extra relative. Since this' family is based upon the marital or "conjugal" relationship, it has been called the conjugal family. Today, however, it is most often referred to as the' nuclear family. The con sanguine family is based not upon the conjugal relationship, of husband and wife but upon the blood relationship of a number of kind persons. The con sanguine family is an extended clan of blood relatives together with their mates and children. 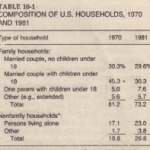 The term ex elided family is often used to refer to the nuclear family plus any other kin with whom important relationships are maintained While Americans use the extended family' for family reunions and other ceremonial purposes, most of the routine family functions proceed on a nuclear family basis. Our folklore warns against in-laws and urges the couple to set up a household of its own. -This is known as Caloocan marriage, as distinct from Patrica Marriageable, where the married couple lives with the husband's family, and from matricidal marriage, where the couple lives with the wife's family. Our laws require a husband to maintain his wife in a . home 'apart from other relatives if she insists. Our laws require parents to support their . own minor children but impose only slight obligation to care for their parents and no obligation to care for brothers and sisters, cousins, uncles and aunts, nephews and nieces, or other relatives. In such a family, affection and responsibility are widely diffused among a fairly large group 'Of people. Children are the joint responsibility o,f the entire family and a child develops a relationship with its aunts very like that with its mother. It is surrounded by many adults, any of whom may momentarily act as parents toward it. This type of family tends to turn out personalities with less individuality than ours, sincy each child has more nearly the same socialization' experience. Such a family protects the individual against misfortune. If a child's mother dies or is neglectful, good substitutes are athand, The consanguine family offers little opportunity for individuality and little danger of loneliness or neglect. Obviously the con sanguine family is not practical everywhere. Where both the family of birth and the family of marriage are in the same village, it is easy to be with one's mate while fulfilling obligations to one's parental family. If they are in different villages, strain is imposed. In, a highly mobile individualized specialized society like ours, the con sanguine family would be unworkable. But for the Atalanta of-Madagascar whose farm work required a cooperative team of a half dozen or more adult males, the con sanguine family was ideal [Linton, 1936, chap. 12].